BOB THE BUILDER DIZZIE. Lego Duplo. Add to your collection ofLego Duplo with this. This Duplo is in good played with condition. Disney Cars, Princess, Toy Story, Police, Fire and Ambulance Vehicles, Circus, House and Furniture. LEGO Limited Edition 40223 - Snow Globe NEW. In brand New condition from a smoke/pet free home. Dispatched Royal Mail 1st Class once payment received. Any questions just ask. 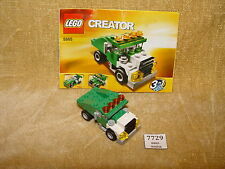 THIS LOT CONSISTS OF A LEGO SET 5865-1 Mini Dumper AS PER TITLE, RELEASED IN THE YEAR 2010. LEGO Sets: Creator: Basic Model THE PIECES MAY HAVE SCRATCHES, TEETH MARKS, SLIGHT DISCOLORATION OR NOT BE AS SHINY AS THEY ONCE WERE BUT, UNLESS OTHERWISE STATED THEY WILL NOT BE BROKEN AND THE PIECES WILL STILL FIT TOGETHER. Lego 6535 - Complete with instructions. 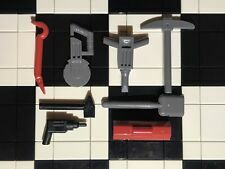 Lego construction worker / builder tools set. Complete set with instructions. Dismantled, checked against the inventory in the instruction book and ready to be rebuilt. Boxed, complete VGC including instructions. Please note this will be posted with the box folded flat- if you do not want this please contact before buying as I would need to charge £1.50 extra for postage. Complete set which will be posted assembled. Sets: Legoland: Construction AS THE MAJORITY OF OUR LEGO IS PRE-OWNED, OUR LEGO GRADING SYSTEM IS THEY MAY HAVE SCRATCHES, TEETH MARKS, SLIGHT DISCOLORATION OR NOT BE AS SHINY AS THEY ONCE WERE, BUT UNLESS OTHERWISE STATED THEY WILL NOT BE BROKEN AND THE PIECES WILL STILL FIT TOGETHER. Lego Galaxy Squad Space Warp Stinger From 70702. From Kit No. 70702. The Instructions are present but no box. Assembled complete figure only no Unity Mask of Ice, no instructions, no box. Assembled complete figure only - no corrupted Hunter Mask. Join the LEGO Construction team ! All our genuine Lego parts are in good used condition. Lego building booklet included - Ideal for young and inexperienced builders age 4 . This is a great set to start your building collection. LEGO: Nexo Knights Stone Stomper Shrunken from 70353 The Heligoyle. New Unbuilt. LegoNexo Knights --- Stone Stomper Shrunken--- Split from 70353. Stone Stomper and weapon ( Axe ) only. 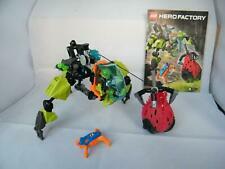 Good condition figure only - no trap or Tahu figure. THIS LOT CONSISTS OF LEGO SET 4201-1 Loader and Tipper AS PER TITLE. Sets: Town: City: Construction THE PIECES MAY HAVE SCRATCHES, TEETH MARKS, SLIGHT DISCOLORATION OR NOT BE AS SHINY AS THEY ONCE WERE BUT, UNLESS OTHERWISE STATED THEY WILL NOT BE BROKEN AND THE PIECES WILL STILL FIT TOGETHER. Set 8959 From 2009. Claw Digger. Lego Power Miners. Including a spare set of new stickers. Lego Cargo Train Overhead Crane from 60052. Included: Lego to build crane. New genuine Lego. "International Signed" parcels cannot be sent to PO boxes except in the Middle East and Africa. International Signed. Two black round bricks do not appear on the picture but are present in the set. 100% Complete set with instructions. For ages 6 . Comes in a box. Sets: Legoland: Construction AS THE MAJORITY OF OUR LEGO IS PRE-OWNED, OUR LEGO GRADING SYSTEM IS RELEASED IN THE YEAR 1974. THE PIECES MAY HAVE SCRATCHES, TEETH MARKS, SLIGHT DISCOLORATION OR NOT BE AS SHINY AS THEY ONCE WERE, BUT UNLESS OTHERWISE STATED THEY WILL NOT BE BROKEN AND THE PIECES WILL STILL FIT TOGETHER. LEGO Sets: See item Title. ALTERNATIVE LEGO LOGO BRICK (AT FRONT OF VEHICLE). RELEASED IN THE YEAR 1971. THE PIECES MAY HAVE SCRATCHES, TEETH MARKS, SLIGHT DISCOLORATION OR NOT BE AS SHINY AS THEY ONCE WERE BUT, UNLESS OTHERWISE STATED THEY WILL NOT BE BROKEN AND THE PIECES WILL STILL FIT TOGETHER. Big mix joblot. LEGO DUPLO BUNDLE. Eyes enough to make animals. 41324 L0411. The Lego Friends Snow Resort Ski Lift is the ultimate winter sports resort for the friends from Heartlake City. Enjoy the mountaintop restaurant, working ski lift, ski slope sliding function, rock climbing wall, ski hire stand, trail map and the little bear with his own slope and mountain cave. ARCTIC HELICRANE SET #60034. "LEGO CITY". RELEASED BY LEGO 2014. ALL AUTHENTIC LEGO COMPONENTS. Sets: Legoland: Construction THIS LOT CONSISTS OF A LEGO SET 652-2 Fork Lift Truck and Trailer AS PER TITLE. AS THE MAJORITY OF OUR LEGO IS PRE-OWNED, OUR LEGO GRADING SYSTEM IS RELEASED IN THE YEAR 1972. THIS LOT CONSISTS OF A LEGO SET 615-2 Fork Lift with Driver AS PER TITLE. AS THE MAJORITY OF OUR LEGO IS PRE-OWNED, OUR LEGO GRADING SYSTEM IS THEY MAY HAVE SCRATCHES, TEETH MARKS, SLIGHT DISCOLORATION OR NOT BE AS SHINY AS THEY ONCE WERE, BUT UNLESS OTHERWISE STATED THEY WILL NOT BE BROKEN AND THE PIECES WILL STILL FIT TOGETHER. Sets: Legoland: Construction THIS LOT CONSISTS OF A LEGO SET 612-1 Tipper Truck AS PER TITLE. AS THE MAJORITY OF OUR LEGO IS PRE-OWNED, OUR LEGO GRADING SYSTEM IS THEY MAY HAVE SCRATCHES, TEETH MARKS, SLIGHT DISCOLORATION OR NOT BE AS SHINY AS THEY ONCE WERE, BUT UNLESS OTHERWISE STATED THEY WILL NOT BE BROKEN AND THE PIECES WILL STILL FIT TOGETHER. Sets: Legoland: Construction AS THE MAJORITY OF OUR LEGO IS PRE-OWNED, OUR LEGO GRADING SYSTEM IS RELEASED IN THE YEAR 1975. THE PIECES MAY HAVE SCRATCHES, TEETH MARKS, SLIGHT DISCOLORATION OR NOT BE AS SHINY AS THEY ONCE WERE, BUT UNLESS OTHERWISE STATED THEY WILL NOT BE BROKEN AND THE PIECES WILL STILL FIT TOGETHER. 41319 L0438. Drive and play in the hot chocolate van with rotating hot chocolate mug icon on top for all to see. Toys > Lego. Have fun whizzing down the double slide on the 2 sledges. Top each mug with delicious whipped cream for a luxurious hot drink experience. Lego Technic 42082 Rough Terrain Crane Sticker Sheet. New genuine Lego sticker sheet. Happy Building! "International Signed" parcels cannot be sent to PO boxes except in the Middle East and Africa. International Signed. THIS LOT CONSISTS OF A LEGO SET 6535-1 DUMPER AS PER TITLE. AS THE MAJORITY OF OUR LEGO IS PRE-OWNED, OUR LEGO GRADING SYSTEM IS Sets: Town: Classic Town: Construction THE PIECES MAY HAVE SCRATCHES, TEETH MARKS, SLIGHT DISCOLORATION OR NOT BE AS SHINY AS THEY ONCE WERE, BUT UNLESS OTHERWISE STATED THEY WILL NOT BE BROKEN AND THE PIECES WILL STILL FIT TOGETHER. LEGO Set 8959. Power Miners : Claw Digger. The miners must collect the crystals using their fully equipped vehicles, before the rock monsters get their hands on them and grow in power! With their stony exteriors and the glowing, crystal-like markings running through their bodies, Brains believes that they may actually be made out of living rock itself. LEGO SENT IN CLEAR GRIP SEAL BAGS & PADDED ENVELOPES. NEW LEGO AS TITLE AND PICTURE.